Earlier this summer, a new scandal erupted when it was discovered efforts were being made to rig Libor, the interest rates that banks use to lend each other money. Initially, regulators in the U.S. and U.K. fined Barclays $450 million for its efforts in the affair, but other facts continued to surface. Now, there have been criminal arrests as the investigation continues. British police announced the first arrests in the investigation. Three U.K. citizens, ages 33, 41 and 47, were taken into custody and brought to a police department in London to answer questions “in connection with the investigation into the manipulation of Libor,” the Serious Fraud Office said in a statement. “LIBOR,” or the “London Interbank Offered Rate,” is a global rate for some $360 trillion worth of financial products worldwide, such as loans, derivatives, mortgages and bonds. During the financial crisis in 2008, LIBOR rates shot up when anxious banks began rescinding loans to each other. Soon, LIBOR became one of the most closely-watched indicators of confidence in the financial system. You may recall the UK’s agency that investigates serious or complex fraud and corruption began its inquiry after learning Barclay admitted its role in rigging Libor. It had agreed to pay more than $450 million to settle with U.S. and U.K. The bank’s CEO Bob Diamond lost his job as a result of it as well. This came after shareholders and British politicians called for Diamond to resign from his position. Royal Bank of Scotland announced it too was in the process of suspending its traders. RBS is 81% owned by taxpayers. It knew it would face tough questions regarding Libor, though it continued to reiterate its total cooperation with law enforcement and bank regulators. It, along with others, received several subpoenas over the summer from the U.S. and other countries. Libor is short for the London Interbank Offered Rate, and is a measure of the cost of borrowing between banks. It’s a collection of rates generated for 10 currencies across 15 different time periods, ranging from one day to one year. An estimated $300 trillion in derivatives products around the world is tied to Libor. It’s an absolute crucial dynamic in the global financial sector. Meanwhile, here in the U.S., investigations with at least 16 other banks continue and date as far back as 2008. A few of those banks include JPMorgan Chase, Citigroup and Wells Fargo. There have been no accusations made and they are said to be cooperating fully with U.S. officials. No one is commenting, though. The scandal also claimed the career of Barclays Bank Chairman Marcus Agius this summer and initially, it was believed the scandal in its entirety was limited to the UK. That’s proven not to be the case though in subsequent investigations. Both Agius and Diamond face the possibly of criminal charges in the U.K. though it’s not been said who was actually arrested. They both appeared before the Treasury Select Committee in the U.K.’s Parliament this summer as they faced tough questions about scandal. Agius resigned in July, less than one week after the UK bank agreed to pay those multi million dollar fines to the U.S. Justice Department as well as the U.K.’s Financial Services Authority. Those charges cleared the accusations that it manipulated a short-term interest rate that is used to set the rates for all sorts of consumer bank loans, from mortgages to credit cards. The scandal has further eroded the reputation of the banking industry, already shaken by the financial crisis of 2008 and a series of overwhelming trading losses, admissions and questions over money laundering and sanctions busting by some of its biggest players in the financial game. As a result, more scrutiny of other financial benchmarks, including those underpinning much of the physical trade in oil markets, is being put in place. By the time August rolled around, the news broke that even more banks, including several U.S. banks, had received subpoenas. 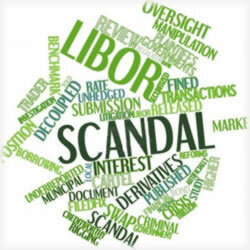 The U.S. was officially in the game, or more specifically, the states of New York and Connecticut, and soon, word came that they were investigating “possible manipulations of the Libor lending rates”. Next, we were teased with suggestions that these subpoenas were “just the tip of the iceberg” and that things were about to become much worse for many of the nation’s biggest banks. In a joint presser, the states’ two Attorneys General, Eric Schneiderman (New York) and George Jepsen (Connecticut), said they had been looking into the scandal for several months. They also said the subpoenas were served as an incentive for banks to hand over various communication documents. They said they believed many American banks played a role in the rate manipulations. One wonders if this isn’t why Mitt Romney didn’t win the election. Had he overturned the Dodd-Frank reform laws, it would have eliminated those safeguards the law was designed to cement. It would also open the door for even worse scandals in the future. Not many have made the direct distinction, but it’s certainly curious – especially considering Romney took massive donations from the nation’s banks and others in the financial sector. What are your thoughts? Do you think the arrests will really result in change in the global financial sector? Is it too little too late? Share your thoughts with us and let us know if you believe criminal charges are appropriate in this case.